On Monday 13th July I attended a one-day workshop at the British Museum on Using Museum Archives, which also inspired my earlier post – The British Museum: Ducking the questions? The workshop was convened by Laura Carter, history PhD student from the University of Cambridge, and supported by The Museums and Galleries History Group and the British Museum Collaborative Research Studentship Programme. – What is the anatomy of a museum archive? – Whose voices are heard and whose are lost? – How do we deal with these absences productively? – Do curators and archivists curate museum archives? – How has a museum’s history acted upon its archive? First – museum archives are fragmentary by their nature and “don’t always answer the questions that you ask of them”; they are also often secondary sources supporting the primary material which are the objects. Second – even the British Museum’s archives are far from perfect; Francesca Hillier, Archivist, shared charts illustrating the constant reinventions of departments and boundaries, plus the movement of entire collections to other sites, to illustrate the challenges of locating records. Most departments hold an archive, but none are fully catalogued. Third – I especially enjoyed Rebecca Coll’s presentation: “Voices heard and lost in the administrative records of an official archive” and made a note in my book to “make contact”. Her project focuses on Dr. Noble Frankland, who was director of the Imperial War Museum from 1960 to 1982 and the radical developments that happened at the museum during this period. Rebecca is doing an AHRC Collaborative Doctoral Award between the Imperial War Museum and the University of Cambridge. As I hope to, she is using oral histories recorded with ex-employees and directors of the museum to fill gaps around the culture, politics and missing voices in the archives. For example, often disagreements or resignations are just not documented. She discussed and asked for feedback on the problems with “off-the-record” remarks which had been made during the oral history gathering. Fourth – I also enjoyed Laura Carter’s presentation: “What if you don’t care about Samuel Johnson? : Using museum archives against the grain of the collection” in that it addressed reinterpreting archives and combing through them to find those “other voices” and hidden stories. Fifth – Caroline Cornish (Royal Holloway, University of London) who, during her talk on “A lost chapter of education history in the Kew Museum Archives” commented that “the collection itself is the archive, and the objects in it are so many documents waiting to be read”. Sixth – Thomas Kiely, British Museum, suggested that Carlo Ginzburg’s microhistorical works, for example, on The Inquisition, are useful models for analysing documents. Ginzburg’s books include the fantastic “The Cheese and the Worms: The Cosmos of a Sixteenth Century Miller“. Seventh – during Kate Hill’s presentation on “Fossils and flashers: tales from the museum archives” she mentioned Antoinette Burton’s book: “Archive Stories: Facts, fictions and the writing of history” which examines the “ethnographies” of the archival world – some more essential reading for me. Eighth – there was discussion around Foucault and the archives (of course there couldn’t be a workshop without the “F-word” being referenced) and I jotted down here and double underlined “epistemological gatekeepers” which I’m assuming floated my boat because it was describes the function of archives …? Ninth – During coffee I met Amber Regis who co-directs the Centre for Archival Practices at The University of Sheffield – another new and intriguing group for me to follow up. The centre aims to work closely with galleries, libraries, archives and museums and “support archival research and dissemination, and facilitates the exchange of expertise and best practice between academics and information professionals”. Lastly – my thoughts as I left the workshop and travelled back to Devon: the day focused on archives created through the process of administering a museum and so my expectations were perhaps a little different to other attendees. My interest is around archives which form a part of the museum collection and, as I sat listening to the presentations I pondered over whether this is fairly unique to museums of professions – in other words collections gathered to record the history of an organisation. For such collections the archive is not just about setting up the museum, it is about the history of the organisation and is very much primary material. Discussions around life-cycles of documents and the diagrams of the constant reinventions of collections and departments got me thinking about the way museum material is interpreted and catalogued depending on where it sits in the processing system – and I drew this little diagram in my notebook. The traditional museum Entry Book necessitates a continuous chronology. The process is also “closed” in that as soon as the next object is received, the previous entry is tied in. Where this potentially changes is at the point of accessioning or cataloguing – a lateral process where classification by type / subject etc creates open-ended information which allows for any number of reinterpretations or additions. For Carlo Ginzburg’s methodologies look at “Clues, Myths, and the Historical Method“, 1990, translated by John and Ann C. Tedeschi. There is a review by Edward Muir in Journal of Social History, Vol. 25, No. 1 (Autumn, 1991), pp. 123-125 on JSTOR. Also Marlene Manoff’s paper: “Theories of the archives from across the disciplines” for an overview and a nice introduction to Foucault and Derrida! 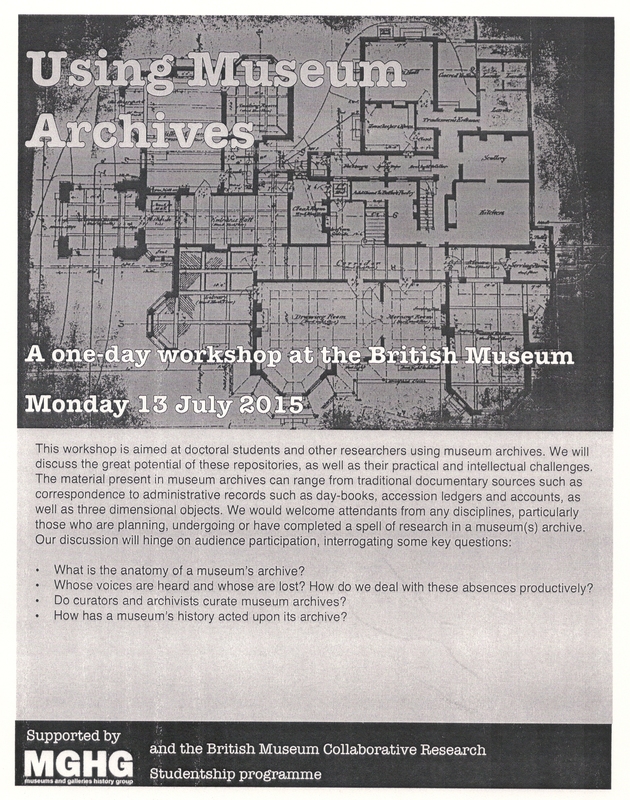 ← 15th July 2015: The British Museum – ducking the questions?